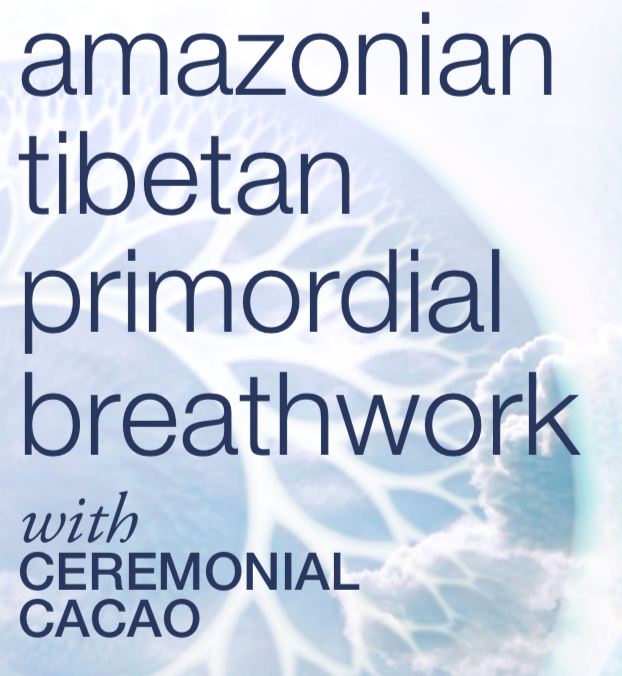 This Primordial Breathwork workshop merges two traditional methods from the Amazon and Tibet. This multidimensional practice rekindles your original connection with the essence of vitality by awakening inherently natural, higher vibrational frequencies of your organism. The practice also aids in the location and elimination of psychosomatic sources of disease, tensions, inhibitions and repressed emotions. Ancient, cathartic and healing breath patterns are applied throughout the ceremony, activating and purifying your primordial memory at the cellular level. This ancient practice is somewhat similar to more recently developed methods, including the Rebirthing method by Leonard Ore, and Holotropic Breathwork, by Stanislav Grof. Primordial Breathwork however is rooted in living inter-generational wisdom , reﬂected in both Tibetan and Amazonian cultures as a conduit of experiential insight into the nature of existence. Another distinct benefit of this practice is the synchronization of the breath via awareness, sound, drumbeat and cyclical rhythm, which ultimately reveals the pulse of life force in nature to be an infinitely diverse and uniﬁed consciousness. The cosmology and the theoretical background of this practice relates to the hero’s conscious journey towards the original state of unconditional presence. In Tibetan and Amazonian cultures, this primordial state is a most vital evolutionary portal to an infinite source of creative life force. This experiential practice cultivates a deeply restful state, allowing life force to flow and be expressed more freely. An optional and complementary ceremonial cacao drink is offered at the event. Cacao is an ancient Amazonian plant spirit invoked for a heart-soul awakening of the energetic and emotional transformation. Pre-registration is required, as space is limited. – If you’re taking any pharmaceutical medications or have a history of mental illness, a heart condition, or are pregnant, you must inform us prior to the session. These questions will be asked on your application form. We will collect a $15 deposit upon registration. If we are not are not able to accept you into the program your deposit will be refunded. If you have to cancel your registration your deposit will be refunded so long as you cancel with one weeks advanced notice. If you cancel within one week of the event, your deposit is non-refundable. Your remaining contribution can be paid when you arrive at the program. Cash is best.